As a landmark development, YouTube has now expanded its non-skippable ad format to more creators, brands and advertisers who are looking to monetise their content. One of the many advantages of non-skippable ads is that your brand can reach its target audience with a complete message. Also, since there is no option to skip the video, your customers have no choice, but to watch the entire ad campaign. With a duration of 15 seconds, non-skippable in-stream ads are very short in nature and pop up before, in between or after a video. Where do non-skippable in-stream ads appear? Ideally, non-skippable ads appear on YouTube, partner sites and apps associated with the Google Display Network. The charges for the ads are estimated based on CPM (cost per thousand impressions) bidding. In this case, you need to pay each time when your ad is shown 1000 times. When it comes to the goal of your marketing campaign, your ad campaign dashboard gives you a plethora of options such as sales, leads, product & brand consideration, app promotion, website traffic and brand awareness & reach. For non-skippable in-stream ads choose your primary marketing objective as “brand awareness & reach”. The next step is to opt for your campaign type as “video”. Ideally, YouTube offers 5 different forms of campaign subtypes such as standard awareness, skippable in-stream, non-skippable in-stream, outstream ads for mobile and ad sequence. So, when your marketing objective is brand awareness & reach, you need to set your campaign subtype to non-skippable in-stream ads. The first step in executing your ad campaign is to give the title of your campaign. Make sure your campaign name is within the limit of 120 characters. The next important task is to enter your budget value. This can be either total or daily accepted value. Once you set your budget, you can customise your campaign flight dates and other settings such as language and location. It will be great if you opt for video partners on the Digital Network to ensure maximum reach. For non-skippable in-stream ads, the bidding strategy should be set to Target CPM (cost per thousand impressions). Ideally, through Target CPM, you are signing up for the average amount for every thousand times when your ad is shown. Choose an appropriate YouTube video which will be used for the ad campaign. Please note that your video ad cannot be longer than 15 seconds. If you wish to run a 20 second video ad, you have to contact the Google team for a whitelist request. 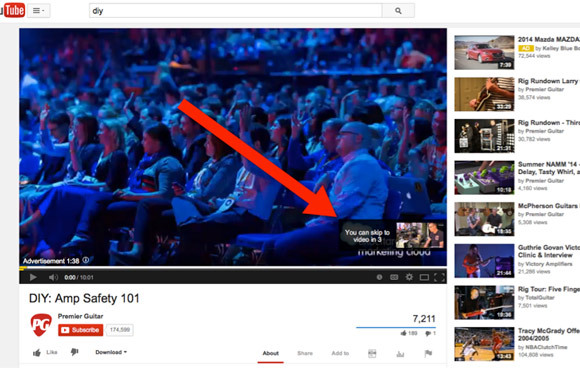 This is the stage in which you are all set to display your non-skippable in-stream ad to your target audience. You can measure the performance of your ad campaign by checking the completion rate in intervals of 25%, 50%, 75% and 100%. However, statistics such as average cost per view, number of views and view rate will not be displayed in the case of non-skippable in-stream ads, since they are measured based on impressions alone. With so many innovations and advanced features, this is the right time for brands and advertisers to venture into YouTube advertising. The biggest advantage is that new features like non-skippable in-stream ads play a huge role in executing cost-effective ad campaigns to reach the next billion internet users in India. Apart from this, they also give you the opportunity to monitor real time insights about the views of your ad campaign. Since becoming a Google Premier Partner, Social Beat has strived to push the boundaries in digital marketing to deliver the best ROI for our clients. We are happy to announce that after being nominated as a finalist for the Mobile and Display Innovation 2018 by Google, our consistent efforts have been rewarded! Social Beat has been selected as the winner of the Mobile Innovation Award at the Google Premier Partner Awards in Mumbai. This award is a testimony as to why brands need a digital-first marketing strategy. This marks the second consecutive year we have been awarded by Google. In the 2017 edition, Social Beat won the Display Innovation Award for our groundbreaking work with Casagrand. Google only chooses five agencies for this award every year and we are honoured to be one of them. India Home Health Care (IHHC), a partner of BAYADA Home Health Care, is committed to providing high-quality care for the health and well-being of loved ones from the comfort of their home. Their team includes professionally-trained registered and associated nurses, medical doctors, medical care-takers, occupational therapists and attendants. The objective for India Home Health Care was to boost their lead generation strategy to acquire better quality leads at the lowest price possible. There were too many competitors in the market that were bidding for the same keywords. There are many restrictions in the healthcare industry such as retargeting. This along with competitors made it hard to reach out to the audience about IHCC. In order to achieve long-term goals, we came up with the strategy of launching AMP landing pages and increased conversions with the help of Google Optimise. Through the SEMRUSH tool, we researched paid keywords that competitors were using and their creatives. This information was used to start a competitor search campaign and bid higher on their keywords as well as increase location bids. We enabled RLSA with effective copies and bid higher for them to improve conversions. Through A/B testing of campaign and effective ad copies of AMP landing pages, conversion rates increased to 0.24% in a short period of time along with low cost per lead. Google Analytics is a very useful tool that helped us get useful advanced audience insights that were used for search and display campaigns. The move from Last-Click model to the Position Attribution Model allowed us to understand the process more effectively. These strategies helped us achieve unprecedented outcomes for our client, IHHC. Our conversion rate increased from 2.16% to 6.17% with a page load time of less than 3 seconds and a 33% decrease in the cost per lead. After the implementation of AMP, the quality score of the keywords increased to 8/10 and conversions increased by 20%. 90% of the campaign was moved to mobile and this resulted in 95% conversions and a 16% click-through rate. The change to the Position-Attribution model allowed us to better understand the consumer decision making process. We are proud of the hard work and dedication of our Social Beat team that consistently exceeds client expectations to achieve the best results for them. You can also read our blog to learn more about How AMP lowered CPL by 33% for IHHC. Whatever be the type of business you are running or the industry you are from, generating leads is what it all comes down to. Without leads, a business has no profit, no revenue and ultimately, no business. However, generating these leads can be a major challenge for companies in the B2B space. Most B2B businesses operate in a very niche segment, which automatically reduces the number of potential leads that can be generated. To add to that, personal relationships with clients has always been the key deciding factor for companies in this sector looking to acquire new customers. These elements might make generating B2B leads more difficult than for other sectors, but it’s not impossible! With the right mix of proven techniques, your business can acquire high-quality leads through the digital medium. So, as a business owner or an entrepreneur, how do you generate leads to grow your B2B business? Let’s take a look at few of the tried-and-tested ways. As the age-old saying goes, Content is King. The biggest advantage of using content marketing instead of advertising as your lead generation strategy is that it reaches users who have activated ad blockers. Advertising your product through search engine-optimised content marketing also helps in boosting organic traffic to your website. Let’s take a look at the various forms of content you can use to leverage content marketing for greater brand awareness. Blogs have become essential for every business and are the best way to generate informative and educational content about your brand. Blogs are also a guaranteed SEO- friendly marketing method that generates organic traffic to your website. By consistently adding authoritative high-quality content on your blog, you can establish your brand as a thought leader in your domain. Over time, your blog will help build a strong community of interested individuals that you can tap into to generate leads. If pictures can speak a thousand words, it is safe to say that videos present the viewers with a thousand pictures. They give viewers a detailed insight into the products and services offered by your company which plays a huge role in influencing their decision to convert into leads. Videos can also present complicated concepts in a very engaging manner that is easy to understand. This can help potential clients get a better understand of your products and services. From a whiteboard video explaining a solution to a particular problem in your industry to a product-centric video, opportunities are aplenty. For Sundaram Business Services, we created a short explainer video detailing how accounting firms would benefit from outsourcing their routine tasks. This video encapsulates Sundaram Business Services’ USPs in a crisper and more compelling manner than any other medium would be able to. Providing a brief synopsis and asking audiences to fill out a lead form to download the full e-book/white paper. This method gives you a hand-picked database of clients who are particularly interested in your brand as they took the time and effort to fill a form just to read your content. To generate quality leads, make sure your content is extremely informative and educational with the right proportion of generic and promotional content. The best way to do this is to understand what your audience is searching for and write about the topic to cater to their needs. Backing up your content with infographics, reports, graphs and other forms of research adds credibility to your claims. In order to explain your services and their advantages more effectively, take your content strategy up a notch and present your audience with an informative case study. Nothing convinces potential clients better than examples of how much you have succeeded in the past with other B2B clients. Content marketing is all about being actively involved in the digital space. Bring out your brand name by conducting webinars or interactive podcasts on topics which are trending among your audience segment audience to spark interest. This will create awareness about your organisation and indirectly showcases your products and services for the world to see. It isn’t just writing high-quality content that is important, but optimising it for search engine rankings. SEO is a guaranteed way to boost your brand image and increase your website traffic. The logic is simple. Most people searching for B2B services on the internet are looking to close the deal. Presenting them with your website is a guaranteed way to effective lead generation for your organisation. As per a recent study, the close rate of an SEO lead is a whopping 14.6% while the close rate of a sponsored lead is a mere 1.7%. Additionally, of the overall local Google traffic, 67% of searches end up in a conversion. With such stunning numbers, there is no doubt that SEO is the most-effective long-term lead generation strategy for B2B businesses. LinkedIn is the biggest professional network in the world, so when it comes to finding potential clients for your B2B business, it is indispensable. It offers more defined targeting options that Facebook does, helping you find your exact target audience, no matter how niche your segment is. The key to successfully using LinkedIn for lead generation is to adopt a ‘full-funnel approach’. Once you create a target audience, ensure that all your promotions are sent to this same template. This ensures that your brand engages with them right from the awareness stage to the final conversion step. Read on to find out what are the tools you can leverage on LinkedIn to widen your clientele. Promoting your blogs on LinkedIn through Sponsored Posts is essential to widening their reach. This tool allows your content to be seen by a highly-relevant target audience who might not have otherwise come across your brand or content. By promoting blogs based on topics that your audience will find useful, you can initiate a relationship with your audience. Being consistent with your promotions will ultimately increase brand awareness and improve your audience’s perception of your company. 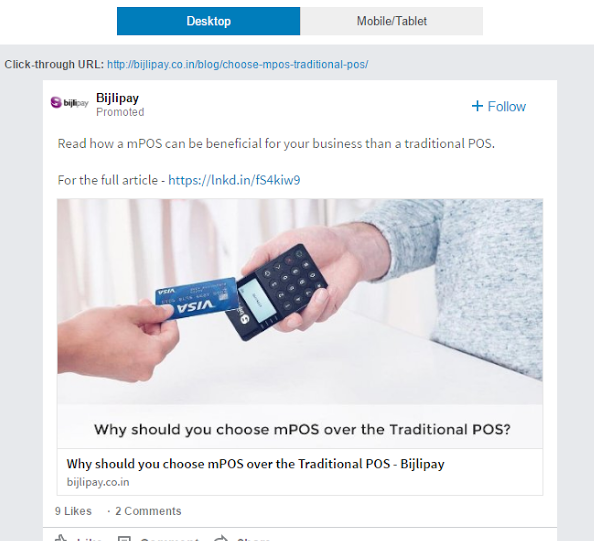 We leveraged LinkedIn Sponsored Posts for one of our B2B clients – BijliPay. We promoted an extensive in-house blog on the benefits of choosing mPOS devices over the traditional POS devices. The blog gives the reader a detailed insight into the services provided by BijliPay and indirectly works as a lead generation platform to convert the reader into a potential client. LinkedIn lead ads take lead generation for B2B businesses to the next level. They work like usual lead ads, except that when you click on the call to action, the browser takes the user to a pre-filled lead form. The form is pre-filled with information retrieved from the user’s profile, eliminating the need to fill it up manually. Apart from saving a lot of time and effort, this feature allows users to fill in the lead form in the LinkedIn page itself without the need to visit a landing page or website. These ads are particularly effective after you have been promoting your content to the same target audience. Since the audience is already aware of your brand and has started to trust you, they will be more likely to submit the form. InMail Ads are ads presented in the form of emails to the LinkedIn inbox of your target audience. This form of marketing is extremely effective as you get to handpick your audience based on their LinkedIn profile and do not need their personal or professional email ids to reach them. Additionally, these emails have a guaranteed delivery rate as they are sent only to the active LinkedIn users. Apart from products and services, you can also use InMails to promote your content and initiate downloads of ebooks and promotional videos. No lead generation strategy is complete without a landing page. A landing page is a single page website that collects the visitor’s information through a lead form. Whether you are promoting your product or allowing visitors to download content (ebooks, webinars and podcasts), building a landing page is often the solution. A targeted landing page will help you capture leads at a higher rate and will help the sales team initiate the lead nurturing process to ultimately convert the leads generated. A good landing page, especially for B2B, needs to always have a clear headline, copy and direct call-to-action, so that the target audience understands exactly what they are signing up for. This is exactly what we did for one of our B2B clients, LatentView. The landing page for their downloadable white paper clearly conveys what the company does and what value audiences will get from the white paper. So you’ve generated an extensive database, with the methods mentioned above, of potential clients who have shown interest in your services. But, what next? The B2B space has notoriously long lead cycles, which can prove expensive and time-consuming for companies. That’s when the tried-and-tested method of email marketing comes into the picture. Email marketing is probably one of the first types of digital marketing, and it still remains a go-to strategy for many organisations. Since emails are one of the most personal forms of communication, they can help you initiate and sustain a strong relationship with potential clients. With email marketing, it’s generally best to keep it simple and use plain-text emails than designed templates. This makes it seem more personal, encouraging people to actually read them. Additionally, you can customise your email as per the preferences of your potential clients with various techniques of retargeting and make your services even more irresistible to them. All you need is a strong email marketing database and a fool-proof email campaign checklist for guaranteed lead conversions. Sundaram Business Services is a business process outsourcing company headquartered in India, with operations in UK and Australia. As a B2B company, a majority of their leads came through referrals and by networking. To scale up, they needed a strong digital marketing technique that could help them acquire new clients faster and more effectively. The target audience for Sundaram Business Services is very niche and difficult to identify. With such a limited audience, generating high-quality leads that had the potential to convert would be more difficult than it would be for a B2C brand with a widespread audience. Additionally, since B2B client relationships are longstanding and based on trust, convincing accounting firms to start outsourcing to Sundaram Business Services would be challenging through digital marketing alone. The Sundaram Business Services blog is a complete knowledge repository, with the right mix of highly relevant and trending topics. We utilised this invaluable tool to its full potential by promoting the blogs on LinkedIn. This created brand awareness and developed our reputation as an expertise in the field of accounting. We created a specialised landing page for Sundaram Business Services which provided concise details of the services and USPs of the brand. By bidding for high search volume keywords, we ensured that our landing page would show up for relevant searches. This further increased brand awareness. Credibility and trust are the foundation of any B2B relationship. To build this for Sundaram Business Services, we created a client testimonial video and promoted it on LinkedIn. This showed our audience the positive relationship we share with our clients. After building awareness and trust among our target audience, we started lead form ads on LinkedIn to actively start generating leads. These ads provided a clear picture of the service we provide and the benefit firms can gain by partnering with us. Since the B2B space is so small, we knew we had to go the extra mile to ensure high quality leads. Content driven marketing is key to generating leads for B2B. Because of this, we promoted an authoritative white paper for which users had to submit a pre-filled form to download. This white paper was by far the best lead generation technique we used for Sundaram Business Services. The white paper was downloaded by CFOs from some of the top companies in India, providing us with valuable information we wouldn’t have been able to achieve through any other strategy. Through the white paper, we were able to achieve an 800% reduction in cost-per-lead with 0 junk leads. In such a niche segment, these results were truly remarkable. It ensured an optimal use of advertising budgets and a large volume of premium leads we could use to initiate the lead nurturing process. These incredible results only prove that content is the only way forward for generating B2B leads. If you are from the B2B sector, its time you implement each one of the above-mentioned marketing strategies in your workplace to take your business to revolutionary heights. Last month, Google introduced a contact form extension for search ads and following its success, they are now replicating it for YouTube TrueView for action. This pre-filled form extension will allow advertisers to generate leads from a channel that has always been known for its top-of-the-funnel marketing approach. Excited to know more? Read on. By leveraging TrueView for action Form ads, your brand can drive leads through an in-line form submission by the consumer. Your video will have a CTA which will lead viewers to a pre-filled form where they can submit their details (name, email and phone number) in order to learn more about your brand. This way, users can submit information directly to the advertisers in an easy and hassle-free manner, creating a win-win situation for both the marketers and consumers. TrueView for action Form ads are compatible with all forms of YouTube targeting including custom intent audiences, remarketing and customer match audiences. So, it is a good idea to experiment with all forms of targeting in order to generate high-quality leads for your brand. Pay attention to your ad copies. Make sure that the headline of your form and the respective CTA is descriptive enough and in line with the objective of your campaign. Featured below is an example of a TrueView for action Form ad implemented for a car insurance company. As you can see, when the user clicks on the CTA button “Send me more info”, they are presented with a form that appears as a drop down. The form is pre-filled making it easier for the user to submit their details and get one step closer to converting to the brand. With TrueView for action Form ads, digital marketers can easily engage with India’s next billion Internet users by tapping the Google and YouTube audiences who are engaging with their YouTube ads. Whether you are a leading real estate developer, an FMCG giant or a top financial organisation, it is time you add TrueView for action Form ads to your digital marketing strategy. For more tips on how to rank your videos, read our in-depth article: YouTube SEO Tips: The Secret Sauce to Ranking Your Videos in 2019. We at Social Beat are proud to announce that, for the second consecutive year, we are a finalist in the Google Premier Partner awards in three categories – Search Innovation, Mobile Innovation and Display Innovation. A Google Partner since 2014, we have continually forged ahead in our endeavours to deliver the best ROI for our clients. Following are a few case studies exemplifying the quality of our work and dedication to our clients. KLAY is one of India’s top pre-school and daycare chains. They approached us with the goal of closing admissions for their schools and day care centres. To help KLAY achieve their goal, we decided to use a comprehensive Google Search Advertising campaign. Our strategy included using RLSA to bid higher for those who visited the KLAY website earlier, CPA bidding, Dynamic Search Ads, etc. We also invested heavily in Call-Only Ads by understanding consumer behaviour in this industry rather than just focusing on landing page conversions. We also utilised AMP pages (these load faster than regular landing pages) and finally, In-Market Audiences in Search. Our client, India Home Health Care (IHHC) is a leading healthcare service company came to us with the objective of increasing quality leads while maintaining a low cost per lead. Since the competition in the healthcare space in India is extremely high, we conducted extensive research to understand their target group before scaling up the campaign. Since a majority of the leads for IHHC came through mobile, enabling AMP would have a strong impact. As this would significantly reduce the load-time of these pages, we predicted that it could generate higher leads for IHHC. Apart from this, we also created smart remarketing lists and using them for RLSA to get better conversions and results, improving the Landing Page UX, focussing on Call Only Ads and Device Bid Adjustments. Here’s a detailed account of how an AMP Landing Page produced 33% lower CPL for IHHC. Shriram Properties is one of South India’s leading real estate developers. They came to us hoping to achieve the objective of driving sales to their properties through Google Display advertising. Employing a creative and innovative approach, we used Custom Affinity 2.0 by developing audiences profile of those who visit competitor thank you page URLs, channel partners and In App targeting. We also utilised AMPs, Multilingual Ads and Landing Pages along with Google Optimise to enhance UX. Here’s an in-depth look at how we helped Shriram Properties achieve these numbers. Social Beat is part of a select group of digital specialists that Google celebrates as Premier Partners. To qualify as a Premier Partner, digital marketing agencies and professionals must prove their expertise in using and applying Google's advertising products. As a young digital marketing agency, we thrive on creativity and innovation. We are constantly pushing the envelope in terms of marketing with an ROI-driven focus to meet, achieve and exceed our clients’ goals and expectations. Whether you are a Real Estate Giant, a leading Financial Firm or An FMCG Brand trying to grow your business by going digital, reach out to us at Social Beat and Engage With India’s Next Billion Internet Users. Interactive ads allow users to engage with them or explore them in new ways. The average digitally-active user is exposed to hundreds of ads every single day! With so many ads bombarding them, people automatically turn on their filters and are able to ignore a majority of these. While this coping mechanism might help a user wade through an ads-saturated world, it can also be a source of great concern for brands. With brands spending huge amounts on advertising, they can’t afford to have their audience simply ignore their ads. So how do you prevent a user from scrolling past, turning off or forgetting about your ad? The answer might lie in the new format of advertising: interactive ads. Interactive ads create immersive experiences for audiences that capture their attention completely. The rich technology that has fuelled interactive ads allows users to experiment and engage with your ads. This helps create a lasting impression on your audience, as a result of which ads perform better. While these ads work on desktop and tablet too, mobile is the platform showing greatest results. As more users spend most of their screen time on mobile phones, this is another reason why brands should start experimenting with interactive ads. Modern-day audiences, millennials, in particular, don’t want to be passive spectators. While digital advertising as a whole offers users a personalised two-way form of communication, interactive ads go one step further. You might have a beautifully designed landing page, but how do you get users to actually click on it and submit their details? Most interactive ads also come with a call-to-action which takes a user to the brand’s landing page or product page. Since interactive ads are more engaging than other formats, users are more likely to actually click on the button. Interactive ads are also more fun than most other forms of advertising. Interactive campaigns in the past have witnessed a 300 per cent higher CTR, positive brand perception and higher recall than other forms of advertising. For most brands, the metric they’re chasing after isn’t just lead generation, but actual conversions of those leads. Interactive ads have an average of 3x conversion rates than other formats like video ads, with this number going up to 7x for some campaigns. On the face of it, interactive ads might appear to have a higher CPL than other forms of advertising like display. However, users who engage with the ad can be retargeted via display campaigns, leading to higher conversions and improved quality of leads generated via digital. Data is the foundation of every marketing strategy and is immensely valuable to marketers everywhere. Interactive ads offer a huge goldmine of data that can go deeper than other kinds of ads. You can gain granular information on how long people viewed your ad, what they clicked on, if they answered any questions, whether they replayed it and if they shared it with others. This data can help you formulate a more refined approach, improving the performance of future campaigns as well. Like other forms of advertising, the platform you choose for an interactive ad will also depend upon your target audience and your defined metrics for success. Here are the top-performing interactive ad formats that brands need to sit up and take notice of. mCanvas is a rich media ad format that helps brands communicate their story in an experiential way. It is designed exclusively for mobile, a platform that is becoming popular in India. Ads designed for mCanvas are beautiful and visually appealing, which plays a large role in attracting higher CTRs and user engagement. After clicking on an ad, mCanvas is able to detect smartphone sensors, allowing users to interact with the ad by shaking, tilting or speaking a command. mCanvas also allows brands to reach out to their consumers in a more focused way through a number of targeting options. For Piramal Mahalaxmi, we decided to look beyond the commonly used digital marketing strategies for real estate in India. We used captivating images of the view from the property to create interactive experiences through mCanvas. Through mCanvas ads on premium placement sites, we were able to direct a number of high-quality leads to our landing page. We retargeted them through Google Display Network, which fetched us a sizeable number of conversions. In this way, mCanvas was an innovative strategy for digital marketing for real estate that helped us push leads through the conversion funnel. A rich media ad includes interactive features like videos, audio, gifs and other elements that make it stand out from a static display ad. With rich media, there is no limit to the creativity brands can use to captivate their audience. These ads are created through HTML5 technology, allowing multiple content formats to be placed in the same ad. An ad, for example, can play a video and conduct a poll simultaneously. Rich media ads can help brands achieve the twin objectives of higher CTR and greater brand awareness. One of the best examples of how rich media lets brand push creative boundaries is Nissan’s 2016 World T20 tournament campaign. Nissan detected an opportunity in the fact that many Indians weren’t able to watch television and keep track of live scores. They developed a series of rich media banner ads that also kept track of live scores. The ads were also interactive because they asked users to vote for their favourite teams before a match started. Nissan’s innovative approach helped them stand out from the numerous other brands advertising during cricket season. Their rich media interactive ads delivered a 4x increase in website visits and 10x higher interaction rates compared to industry standards. A commonly used form of rich media ads is Lightbox. Lightbox is a format of interactive ads developed by Google. When you click or hover over a Lightbox ad, it responds by expanding. A Lightbox ad can expand to fill your entire screen, play a video or take you through a carousel of images. The ads also generally end with a link to your website. Since these ads are more engaging than traditional formats, it increases the likelihood that a user will actually click on your website link. Lightbox ads automatically adapt themselves to fit your screen size, so they work perfectly on mobile, tablets and desktops. The same display targeting options are also available for Lightbox ads, helping brands ensure they reach the right audience. Video ads are one of the best-performing advertising mediums with 64 per cent of viewers buying the product after watching branded videos. When combined with interactive features, they become even more effective. Interactive videos transform what is usually a passive viewing experience into one that actively engages with them. Viewers can answer questions during a video, influence sequences of the storyline and even play games. Interactive videos capture your audience’s attention completely and can be a powerful way to generate leads or send viewers to your website. At Social Beat, for example, we used an interactive format for our Team video to make it more fun and engaging. Questions popped up at regular intervals and viewers could click on them for answers. This held their attention for a longer time and even helped them learn more about our brand in the process. Interactive ads have delivered proven results across the board for FMCG, BFSI and B2B brands. With audiences today looking for greater value from advertisements, interactive formats certainly have the upper hand. From downloading low-quality music videos on Napster to watching the latest shows in HD on Hotstar, the data consumption pattern of online users has come a long way since the advent of the Internet. Today, the personal-is-the-new-premium approach presented by YouTube has pushed brands to allocate their marketing budgets to the second most-used search engine in the world and rethink the immeasurable mass reach offered by traditional TV ads. The truth remains that, the screen doesn’t matter as long as consumers have the power to choose what they want to watch. With 100 million Indian users every day and 225 million average Indian users every month, YouTube is the new game-changing element in every marketer's agenda. Do you reach out to your mobile phone when your favourite TV show breaks for a commercial? You are not alone! According to a recent survey, 87% of TV viewers have another screen in front of them while watching TV. It is also estimated that by 2025, nearly half of the current TV viewers will unsubscribe to paid television services. This only proves that the days of watching irrelevant commercials on the idiot box are over as consumers have shifted to video platforms like YouTube where they have the power to exhibit a fluid behaviour. YouTube is where primetime entertainment lies! This platform has the most-engaged database of a whopping 1.3 billion users who are watching 5 billion videos every single day. It is time brands adapted their media plans to where their consumers are engaged the most, making Youtube ads a clear winner to where your marketing dollars need to go. Brands showcase TV ads based on the Gross Rating Point (GRP). This measure determines the frequency at which you want your ads to be played and the reach of the ad depending on the time when it is played. But the biggest question of the hour is that who are the people you are playing your ads to? Did the ad influence their consumer patterns? By marketing your brand through YouTube Ads, you have better control over the advertising process. Let’s take a look at the reasons why brands should leverage the power of YouTube ads and adapt to the fast-changing viewing habits of consumers. By optimizing AdWords for video ads, you can easily track the results of your YouTube ads. With simple steps in place before launching your video ad campaign, you can make the most of your marketing budget and generate higher ROI. You can track the number of views your YouTube ads have generated and the amount of engagement caused in the form of likes and shares, to begin with. You can also measure the performance of your YouTube ads with the View-Through-Rate (VTR). This metric reflects the rate at which consumers have viewed your ad and will be high if your ad is doing well. You can also track the number of leads your ad has generated depending on the goals you have set based on your brand. Unlike TV ads, you can hand-pick the audience you wish to target with your YouTube ads. There are a plethora of factors you can use to screen your target group. Few of them are discussed below. Demographics: You can filter your audience based on their location, age, gender, income, relationship status and much more. Interests: Targeting people who are interested in what you offer is a great way to advertise your brand. Reach out to a niche audience who already has your attention to improve the quality of your leads. Keywords: Make your ads play only to the viewers who have typed in the keywords related to a popular video on YouTube. Behaviour: The targeting provided by YouTube ads is so extensive that you can also play your ads to the viewers who have visited your website, as a re-targeting technique. For more tips on how to rank your videos to reach the right audience, read our in-depth article: YouTube SEO Tips: The Secret Sauce to Ranking Your Videos in 2019. There are a number of options to choose from when it comes to YouTube advertising, catering to different target segments. From 6 second ads to longer versions, which are skippable, YouTube has it all making it a more powerful tool than traditional forms of advertising. YouTube ads are divided into three broad categories. TrueView ads are the most common type of YouTube ads that play before a particular video. Marketers can choose from skippable TrueView ads that can be anywhere between 12 seconds to 6 minutes and non-skippable ads that cannot cross more than 20 seconds. In-Display Ads: In-Display ads show up on your YouTube home screen and also in search results, just like the ads that appear in a Google search. They also appear in the related videos section while watching a particular YouTube video. In-Stream Ads: In-stream ads appear before the video of your choice begins to play. They have the option to be skipped after 5 seconds and can also display overlaying text as a call-to-action based on the brand being advertised on YouTube. Masthead ads provide high reach and awareness as they are displayed as the main banner on the YouTube homepage. This type of YouTube ads is charged on a day-to-day basis and come with a variety of key benefits. They are primarily used to create a buzz about your brand by reaching out to consumers in a wide range of demographics. A masthead ad is much more cost-effective than a TV ad as it helps brands reach an approximate of 350 to 400 billion consumers at Rs. 70 lakhs – which is still lesser than how much brands pay for a primetime slot on the TV. Additionally, the frequency with which the ads will be displayed to the viewers is much higher, and the brands can also use the database to re-target the people who have viewed their ad. Bumper ads are the shortest form of ads available at slots of just 6 seconds. They play before the YouTube video chosen by the viewer and are an excellent way to complement a larger video ad campaign. Since these ads are shorter, advertisers need to focus only on the primary aspect of the brand they want their audience to recall. Asta Properties – one of the leading real estate developers in Chennai – used a media mix of print ads and YouTube ads to advertise the launch of their premium new property, Asta AVM. Instead of opting for the traditional approach of TV and print, they marketed their new development through YouTube ads and the results were outstanding. We helped them run ads in both Tamil and English to tap into the potential of regional content online and engage with India’s next billion Internet users. We were able to reach 17,52,661 users through YouTube with 3954 clicks on the whole. We targeted an audience within the age group of 35 to 54 years of age who are looking to buy properties and can afford an investment of Rs. 1.5 crores and above. The biggest benefit with YouTube ads is the cost-effective approach they provide. A TV ad for the same campaign would cost a whopping Rs. 2000 per second on leading Tamil channels like Star Vijay with no means to track the performance of the ad or target the people who have seen your ad. A bumper ad, on the other hand, costs just around Rs. 1.20 for 1000 impressions, based on the sector of the brand. We used the detailed targeting methods of YouTube ads to reach out to potential customers for Specsmakers – a leading eyewear company in the southern states of India. We implemented the onion peel strategy to understand the buying pattern of potential consumers and leveraged those results in their marketing campaigns for enhanced lead generation. This survey-oriented strategy included reaching out to the target audience and asking them a set of questions that threw light on their online consumer behaviour. The audience was then categorised into primary and secondary circles and targeted better through YouTube ads. The ads helped us increase the number of footfalls to their stores by a whopping 400 customers during the campaign period which was less than 20 days. The ad showcased an irresistible offer provided by the brand and was in the form of a bumper ad, creating the exact amount of excitement and hype. The same ad on TV will cost around Rs. 6000 on prime channels like Colors during the peak hours of viewership, which is a strikingly high budget compared to the average Rs. 1.50 for 1000 impressions offered by YouTube ads. Furthermore, you can leverage a wide range of performance metrics to track the performance of your ad. YouTube is the most underrated advertising platform, primarily because TV is the go-to medium when it comes to video marketing. However, times are changing now. The annual viewership of YouTube is growing by 40 to 50% every year, so if the traditional medium of television is still on your marketing agenda, it is time to revisit your strategy. Whether you are from the finance industry, FMCG market or the real estate sector, switch to YouTube ads to bring out the true potential of your brand and attract potential consumers like a moth to a flame. A recent study by Nielsen and BCG revealed that India has a $100 billion opportunity for brands as the amount of time consumers spend on mobile and the number of digital transactions conducted increases. As 81% of users research their options on a mobile phone before actually making a purchase, reaching them through mobile platforms is becoming increasingly important. This is why, for digital marketers, in-app marketing has become one of the most important channels to drive customer awareness and generate leads. Mahindra Lifespaces took advantage of this trend in their lead generation strategy. The phenomenal results they achieved proved that a mobile-centric approach might be the future of advertising for brands. Mahindra Lifespaces is one of India’s leading real estate developers with multiple projects spread across the country. They are the pioneer in developing environmentally sustainable projects and deliver premium living spaces to their customers. To match the company’s novel approach, they also needed an innovative digital advertising strategy to help them stay ahead of competing brands and expand their customer base. For this campaign, the objective was to leverage in-app ads to drive more leads for Mahindra Lifespaces at a significantly lower cost per lead as compared to other targeting strategies previously used. For the Mahindra Windchimes project in Bengaluru, we made extensive use of in-app ads to tap into a huge potential consumer base. In-app ads are placed strategically within selected apps, so customers are exposed to it while spending time on the app. With consumers today spending more time on essential mobile apps, reaching them through this medium has proved to be one of the most effective strategies. In-app marketing will also prove to be one of the biggest ways digital marketing will transform the real estate sector. To do this, we implemented a three-step approach to developing an effective in-app marketing strategy. The demographic targeted for this campaign was the 35+ age group as this would be the segment who were advancing their careers and looking to buy a home. All marital statuses and both genders were also targeted, however, males performed better. Business - document editors/viewers, email management, job searches, etc. Finance - banking, digital payments, financial news, ATM finders, tax calculators, etc. Photography - camera and editing tools, photo management, file sharing, etc. Books and reference - book readers, reference books, dictionaries, thesaurus, etc. House & Home - house and apartment searches, interior decoration, home improvement, mortgage calculators, etc. These apps would be the most effective ways to maximise reach among our target audience. As in-app advertising is a largely visual medium, the display creatives used needed to be catchy, informative and entice customers to visit the page. A mix of high-performing standard display creatives was successfully used to capture the target audience’s attention. With in-app ads, we were able to deliver conversions that were 76.38% cheaper than other display targeting campaigns. In-app ads also helped us increase conversion rates by 267.92% compared to previous display targeting campaigns used. In a nutshell, in-app advertising helped us gain higher conversions at a lower cost. This proves just how effective platform apps can be for brands looking to boost their lead generation and conversion strategy. With the Digital Marketing Industry Report 2018 stating that 40% of brands are looking for lead generation through digital marketing, implementing in-app ads could be one of the most important methods for them to achieve this goal. The faster brands adapt to this advertising strategy, the better equipped they will be to reach larger customer bases. As the saying goes, the only competition that matters is the competition you have with yourself – and Google is the best illustrative example of this quote. The world’s favourite search engine has crossed yet another milestone by outgrowing their primitive advertising and publishing platforms. Google AdWords, DoubleClick and Google Analytics 360 Suite will now be available in an all-new avatar to showcase the full potential of their services with upgraded solutions that make advertising and publishing much simpler for online marketers. This, in turn, will help in improving the quality of leads and increasing sales. Let’s take a look at what Google’s rebranding strategy has in store for us and how brands can benefit from it. The integrated platform of Google AdWords has now been transformed to Google Ads with a new identity and an extensive list of digital advertising services. As the name suggests, Google Ads supports all the prevailing ad formats, from text and display ads to video and app installs. These ads can be showcased on a variety of platforms including YouTube, Search, Gmail and Maps, to name a few. Google AdWords was launched 18 years ago as a platform to generate text ads on Search. Over the years, the tool has grown multifold with extensive types of ads available on various platforms. This paved the way for Google AdWords to be rebranded as Google Ads, with advanced features to create a flexible program for advertisers based on their marketing goals. The second tool launched by Google in their rebranding efforts is the Google Marketing Platform which is an integration of DoubleClick advertiser products and Analytics 360. This tool will help online marketers analyse the performance of their pages and optimise the digital media spends on one single platform. Google noticed the pattern in which marketers used both DoubleClick and Analytics 360 in their advertising strategies by consecutively using the two platforms. The advertisers who integrated both the platforms on their own witnessed better results with optimum usage. With the Google Marketing Platform, advertisers can now directly reap the benefits of both the tools to plan, analyse and optimize their media spends. The Google Marketing Platform also introduced a brand new Display & Video 360 feature that combines a range of Google’s display advertising solutions. The products under this feature include DoubleClick Bid Manager (BDM), DoubleClick Campaign Manager, DoubleClick Studio and Google Audience Center 360. Additionally, DoubleClick Search, which is used as a search management platform by enterprises, has been rebranded as Search Ads 360. The comprehensive platform also features an integration center for marketers to hand-pick the tools of their preference and integrate them, providing a tailor-made program for every advertising strategy. The third consolidated platform launched in the rebranding series is the Google Ad Manager. This platform acts as an umbrella tool which integrates DoubleClick for Publishers (DFP) and DoubleClick Ad Exchange (AdX). Through Google Ad Manager, advertisers can leverage the ad-serving solution of DoubleClick for Publishers and sell advertising inventory through the solutions provided by DoubleClick Ad Exchange. This will lead to “AdX buyers” being referred to as “Authorised buyers” in the near future. Whether you come from real estate, BFSI, FMCG or any other industry, the new integrated tools launched by Google will be a game-changer for digital marketers. These platforms are scheduled to be rolled out by the end of July with the common objective of simplifying the advertising process for marketers to maintain the pace, energy and enthusiasm with which digital marketing is skyrocketing in today’s world. With the Indian real estate space getting increasingly crowded, it has become a significant challenge for developers to differentiate themselves from their competitors. In order to stand out, real estate developers need to try something unique to gain the upper hand. With the tier II and tier III cities being active on the Internet and most of them using vernacular language to consume content, Casagrand formulated an innovative vernacular ad strategy to engage with India’s next billion internet users. Here’s how Casagrand utilised vernacular content in their ads as one of their key real estate digital marketing strategies to reach this market and achieve an incredible 90 percent increase in leads. According to the Google and KPMG report, the number of regional language speakers online in India will reach 76 million within the next five years. As this audience base grows in size and influence, it’s important that brands start creating multilingual content targeted towards them. Casagrand capitalised on this opportunity and developed a regional language-focused approach in their marketing strategy. We identified the Tamil-speaking consumers as the primary target audience since most of Casagrand’s projects are located in Chennai. Based on this, we began developing vernacular ads in Tamil so we could reach out to these consumers directly. We used vernacular ads extensively for specific projects like Casagrand Uptown. Speaking to this regional audience in the language they were most comfortable with, Casagrand was able to develop a relationship built on trust and comfort with their target audience. This played a pivotal role in helping us generate high-quality leads for Casagrand. We identified the Google Display Network as the most effective way to reach our target audience to create maximum impact. Google Display Network allows us to find the right target audience and deliver our message contextually. One of the tools we used to maximise reach through custom affinity audiences. Building bucketed Custom Affinity Audiences allowed us to reach out to our specific target audience to ensure the right people were coming across our message. Gmail Ads displayed at the top of a user’s inbox also proved very effective in creating awareness and generating leads. One of the most important ways digital marketing is transforming the real estate sector, is by creating brand awareness right from the initial stages of the buying process. As one of Casagrand’s primary objectives was to occupy the mind space of potential buyers, maintaining a high impression share across relevant keywords was very important. Through competitive bids on generic keywords (eg. 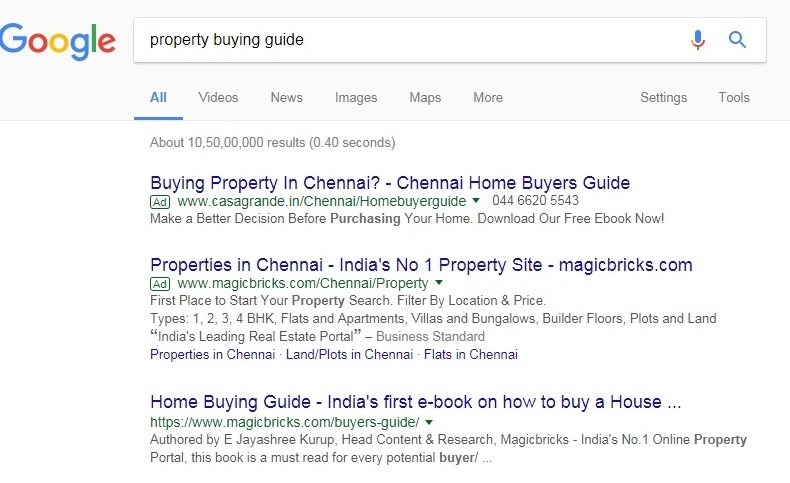 2 BHK apartments in Chennai), as well a brand-specific keywords, we ensured that users would continuously come across Casagrand’s ads in their search results. This helped increase the number of quality leads generated. Through this extensive and in-depth approach, we were able to generate an unprecedented increase in the number of leads for Casagrand. Our strategy of utilising vernacular ads helped grow Casagrand’s leads by 90 percent QoQ and also increased the overall click volume by 85 percent QoQ. Vernacular ads were extensively utilised in the Casagrand Uptown project marketing strategy, with 50 percent of total spends being allocated to Indic Display Creatives and targeting. This approach delivered significantly higher leads and a CPL that was 60 percent lower than that of normal display creatives. These results prove that vernacular ads offer massive benefits not just in terms of increasing brand awareness, but also in delivering higher ROI. As the number of regional language users growing at a faster pace than English language users, they are quickly becoming one of the most important segments for brands to focus on. The phenomenal results Casagrand achieved by implementing a strong vernacular ad strategy is proof that brands cannot afford to ignore India’s regional audience. To learn more about our work with Casagrand, you can also read how we helped Casagrand generate a record 190 crores in revenue via Facebook. The Google Display Network is a vast network in the digital world. It helps not only by displaying ads to people who are looking for your brand but also to people who might be interested in your brand and are occupied currently with some other work like browsing another website, watching a video on YouTube, checking their mail, reading reviews or using their mobile apps. Google display network offers umpteen ways of targeting your ad but finding the best targeting might seem to be a tough job at times. For this reason, Google has made it easy and has introduced smart display campaigns where our job is just to provide ad assets and set a target CPA, and Google does its best to drive as many as conversions as possible. The ad’s adaptability allows you to expand your reach without you having to create dozens of ads in all the combinations of ad types and sizes. In these types of campaigns, Google sets its target audience and placements which it feels is worth spending for. Smart display campaigns are used when the advertiser wants to target additional customers beyond the manually targeted audience. As per google, the daily budget should be 10-15 times the target CPA bid. Unfortunately, smart display ad option may not be open for all the accounts. The advertisers have to check if they are capable of running a smart display ad before they plan. There is a passing criterion of at least 50 conversions on the display network and 100 conversions on the search network in the past 30 days without which running the ad might not be possible. Creating a smart display campaign is very simple. The process is similar to that of a display ad creation. When you promote the ad, click on “Marketing objective radio button.” In the drive action objective, select an appropriate option which then lets us know if our account is eligible to create a smart display campaign. Once you have created the campaign, set the campaign budget, and the target CPA goal. We provide only the ad assets, Google then scans your website and selects appropriate images with which it creates a series of responsive ads to be tested. Be aware of your asset size restrictions before you start, so you have all your ducks in a row before you start creating your SDC. The smart display bids are based on target CPA where the performance data suggests the highest likelihood of conversion occurrence. The bid is automatically set higher, and when there is a minimum probability of conversion, it is set lower. The campaign should start optimising in two weeks or after 50 conversions, whichever comes first. Note: Google does not guarantee to stick to the target CPA, it may vary according to various factors. As the name suggests, the targeting is based on tracking which demographics, locations, etc. help in more number of conversions for the ad. Smart display campaigns cover two targeting methods; automated remarketing where ads are targeted to the website visitors and automated targeting where people just above the buying phase of the marketing funnel are targeted. If a remarketing campaign is already created in another campaign, the ad with higher relevance shows up. Apart from these, site category exclusions can also be specified. Note: Avoid going for smart display campaigns if you have a very specific target audience in mind. This feature is similar to that of a responsive ad. We enter the ad copies, images, logos, etc. and google assembles it into various types, sizes and shapes based on where the ad appears on the google display network. Also, read our blog on the most definitive guide to optimising your AdWords campaign. Smart display ads help you discover which of your ad copies or images have worked well for your brand. By now many of you would have come across the latest feature released by Google Adwords called “Account Health Score for Search”. It can be found in the opportunities tab of the AdWords interface, where it displays a certain score along with a list of suggestions to improve your account health across various parameters, as shown in the image below. So What’s this “Account Health Score for Search” all about? This is a beta tool introduced by Google that analyses the AdWords account and grades it based on how well the Search Network campaigns are configured. It comes with a set of recommendations that when implemented, will help in improving the score and performance of your search campaigns. The score is between 0% and 100%. The better your campaigns are configured, the better it performs in terms of conversions and cost per conversion (lead or online sale). While starting a new ppc campaign or optimising an adwords campaign can be quite tedious, this tools gives you a ready checklist. How to check the score and get started? Does the account health score matter to you? Adding call extensions – The utilisation of call extensions will help in increasing the traffic to the website by driving calls to your business. Ad groups with keywords – An ad group without keyword is like an aeroplane without fuel. To enable your ad groups to run, add at least one keyword to each ad group. Ad groups should have enough keywords – Adding additional, relevant keywords can help you reach potential customers who aren't seeing your ads. Hence you should have enough keywords to have higher traffic to your website. Ad groups with active ads – Your ad groups won’t be active until at least one of the ad copy is live. Hence, if you want your ad groups to run, then create at least one ad in your empty ad groups. Showing ads on Google search partners – Even though Google has a vast inventory and reach in the world, targeting Google search partners will increase the number of people who can see your ads, thereby helping you in obtaining additional traffic to your website. Using a recommended daily budget – When your budget gets limited, it will impact your ad delivery which in turn will result in losing out on reaching out to your potential audience. Hence using a recommended daily budget will help in gaining additional traffic to your website. Adding Callout extensions - The purpose of adding Callout extensions is to improve the CTR. It gives more information about your business in addition to the message conveyed in the ad. Ad groups should have multiple ad variations – It’s a well-known fact that every individual has different preferences and likes. Hence, having multiple ad variations would help in connecting with your target audience well, thereby increasing your CTR. Adding Sitelink extensions – Sitelink extensions are individual sections of the website through which you could direct your potential customers so that they can quickly find what they're looking for. Using first page bids for high-quality Keywords – There's a saying that we can bury the dead body on the second page of Google's search results. If you want to get quality traffic and high CTR, then you should use first page bids for at least high-quality and valuable keywords. Using conversion tracking – Using the conversion tracking will aid you in keeping track of which clicks are turning into customers or leads thereby allowing you to optimise your account to target the best clicks. Using an optimised ad rotation setting – Based on your goals, you should use appropriate settings for ad rotation. If you want to increase the number of conversions, then "Optimise for conversions" option to get the maximum out of it. Using Enhanced CPC – Enabling Enhanced CPC raises your bid for clicks that are more likely to lead to a sale or conversion and lowers your bid for clicks that are less likely to lead to a sale or conversion. Using a mobile-friendly site – With mobile usage rising at an exponential rate, having a mobile friendly site would help your customers to have a better experience on the device they use the most. Using standard (optimised) delivery – Using optimized delivery of ads will help the advertisers in spending the budget optimally by showing the ads on the most relevant searches throughout the day. This helps in improving the ROI as your ads will always be shown to your intended target audiences whenever they are searching for your products and services. By implementing these suggestions, it can definitely help in improving your ROI to some extent. To know more about ROI, check out - Measuring ROI of Digital Marketing. Adding negative keywords – Having a proper negative keyword management system would help you in reducing the wastage of spends and thereby helping you to ensure that your ads only appear on relevant searches. Our recommendation is to make use of this tool and implement all the suggestions provided by Google. It helps you to take advantage of many features that Google has to offer you and get the best out of your advertising efforts. So you’ve developed a mobile app, excellent, but what next? There are more than 4 million apps in the Google Play Store and Apple App Store and this number will only increase with the coming years. While each app is exclusive to the developer, only a few get the deserved recognition from users. To be precise, the fate of your app after its development depends on how many users download and use it. According to research, 63% of apps are discovered through app store searches, so it is highly essential to optimize your app for the app store. Here are some best practices to get more app downloads and to increase your rankings in the app store. No, naming your app after you or your business won't work well. A good idea would be to choose two to three keywords and using at least one of them in the title of your app. According to data, apps with keywords in the title rank 10.3 per cent higher than those without a keyword in the title. This way, your app will show easily in the search results. However, make sure that you don't make the app name look like a spam by overstuffing keywords. The title needs to be short because that’s what users can read in a single screen. Obviously, you don’t want your title to get cut. Titles are usually cut after the 23rd character (including spaces) in the App Store and the 30th character in Google Play. The first thing that the users see about your app is the name and icon. This is the first and the best chance to impress your users. Therefore, be cautious and creative when thinking of a name for your app. Make sure the description is precise and concise and brings out what the app does exactly. Use bullet points wherever required and avoid dense paragraphs. As we said before, an app icon and the app’s name are the ones that catch your users’ eyes easily. Make sure that your app’s icon is designed from scratch. Also, do not make it too elaborate or complicated. Keep it simple, unique, and attractive and make sure the icon breaks through the clutter. Do remember that the play store and the App Store have both varying standards in terms of size, geometry, and color scheme of app icons, so design the icons accordingly. The iOS icons should be sized to at least 1024×1024 pixels and the Google Play requires a 512×512 icon. Like any other software, your mobile apps will also need regular updates and upgrades. If you launch your app and forget it, your users will download it and forget or uninstall it. Release periodical updates with relevant release notes explaining what’s new in the update. You don’t have to urge them to review or rate you with pop-ups every other minute, but gently nudge your users to rate your app. This will always help in increasing your views. Furthermore, do not ignore negative reviews, but pay attention to what was wrong in the users’ experience and try to fix it. The apps with high ratings are all ones that keep their audience engaged and take customer feedback positively. You can also make use of influencer marketing to get your app reviewed by top digital influencers. If your app is something that needs to be bought, set a competitive pricing. Instead of making your app more expensive than other similar apps, set a nominal price and improvise on making your app the best in the category. If your app is free, then add it to the in-app purchases category to improve its listing and visibility. When your app is available in various languages and is compatible with different OS versions, it is bound to get more view and reach than an app released only for one OS and in English. Both the iOS and the Play store allow you to localize your listings to make discovering your app easier for customers in other countries. We hope by now you have understood the various best practices that must be followed to improve your app download. Comment below some of the other tips that you would like to add to our app store optimisation cheat sheet. The Team at Social Beat is excited to announce that Social Beat has now gone from being an accredited Google partner to becoming a Premier Google Partner for Google Adwords/Pay Per click Advertising. Our newly acquired Premier Google Partner badge certifies us as a company trusted by Google, which is capable of providing the highest levels of service to clients. We have fulfilled Google’s three main requirements for being a Premier Google Partner. Google requires the team handling Adwords to prove their advanced AdWords knowledge by getting certified in AdWords. All team members handling Adwords campaigns at Social Beat are certified by Google to have the required levels of competency and proficiency to run successful campaigns. Premier Google Partners are required to demonstrate that they are maximizing their clients’ performance by implementing Google’s recommended best practices in client accounts. Google reviews Partner agencies’ client accounts to make sure that their clients are getting excellent service, including the type and frequency of the changes being made, client retention, and whether they’re making the most of their clients’ budgets. Contact Us to get your Adwords campaign started or to optimize an existing campaign for better ROI. Every business big or small, belonging to any category is using digital marketing to help their business grow and reach the masses. Internet marketers know that Google Adwords is an excellent way to drive traffic to a website. Setting up an Adwords campaign is not just about making ads and running them but also getting the best results for the amount invested. So, how are the best results obtained? The best results are obtained when the campaign is setup properly (check out our definitive adwords campaign launch checklist) and optimized properly on a regular basis. Therefore, optimizing Adwords campaign is important, else if not managed properly, it can prove to be expensive for the business. Optimizing an Adwords campaign is the most complex task, as every aspect of the account like click through rate, poor performing ads, using correct keywords, avg. cost and much more, needs to be analyzed. The optimizing process is continual and will have to be paid constant attention to, in order to maximise revenue and gather sufficient data about the account performance. Here are a few tips to optimize your Google Adwords Account at different levels of the account. 1. Checking on bid adjustments: Bid adjustments allow you to show your ads more or less frequently based on when, where and how people search. Bid adjustments are set by percentages which can be either increased or decreased. Mobile Bid Adjustments: Depending on the number of clicks and converted clicks, you can increase or decrease your mobile bid adjustments. As the image below shows, since the conversions from mobile are higher, the mobile bid adjustments have been increased by 50%. Location Bid Adjustments: If a campaign has no location selected the ads will show on all locations. To avoid unwanted impressions and clicks always select the location before the campaign is live. Location bid adjustments help you decide which locations you want to focus more on, based on their performance. As the image shows that conversions are higher in Greater London, the bid has been increased by 25% making your ads appear more frequently. 2. Search v/s Search partner networks: Check how ads are performing on the other search network partners with Google. If conversions are less you can always go to the all settings tab and chose to not show ads on other Google search networks. By clicking on that option your ads will not show on other Google networks. 3. Top v/s others: By selecting the top v/s others option under the segment tab, a table with statistics appear showing where your ads appeared on the Google search top (above the organic search) and otherwise (below the organic search). The below image depicts that conversions are higher when the ads are on top, so to always remain above the organic search one can increase their CPC and get higher conversions. Similarly, sometimes being below organic search i.e. “Google search other” shows higher conversions than Google search top. In this case you do not bother about increasing your bids to be on the top. 4. Ad Schedule: By adjusting the ad scheduling bid you can show your ads on specific days and also at specific times. At the campaign click on the dimensions option and see which day ads conversions are higher, based on this data adjust your ad bids. The below report show that conversions are higher on Saturday, Sunday and Monday. Based on which the ad schedule bid adjustments have been increased so that ads appear more number of times on those days leading to higher conversions. Pause poor performing ads: For an Adwords campaign to succeed and meet the business goals you need to regularly review and refine your ads performance. Ads with high conversions and CTR are performing well and which do not have conversions and CTR are not performing well. Such ads can be paused. AB test ads: AB test ads basically mean that in the same ad group you have the same ad with different variations. The elements of variation could be: Ad text, the negative keywords for the ads and different landing pages. This AB test ad method will help you see which variation is performing better. Based on the data the other ads can be paused or changed. Pause Unproductive Keywords: At the campaign level choose the keywords tab and click on the download button. This keywords performance report will give you the details on how each keyword is performing and what is the avg. Position, converted clicks, CTR, Cost, Clicks and impression.Based on the statistics from the report pause keywords which are expensive and have less or no conversions and CTR. Improve Keyword Quality Scores: The quality score of any keyword depends on the ad relevance, expected CTR and the landing page relevance. So, to improve the quality score for your keywords, ensure that your ads have relevant keywords in them and that keywords are grouped correctly to ensure relevant ad copy is served to users. Add Negative Keywords: A search terms report shows the keywords customers are searching for. Based on this report you can either “add” or “exclude” the keywords at the campaign, ad group and the ad level. Manage Keywords Bids: When you select each keyword you chose how much you are willing to pay. This is known as the keywords maximum cost per click. Based on how your keywords are performing you can increase bids for better performing keywords - keywords with large conversions and low cost per click. And it’s done! Those were few tips to optimize your Google Adwords campaign in a profitable manner. If there are any other Adwords optimization techniques you use that are not mentioned, then do let us know in the comments below. When you are creating your first Adwords campaign, chances are high that you may miss out on some key points and settings. Even if you do create campaigns every day, there are possibilities that you may fail to notice a few things. Here’s a checklist to help you ensure that everything is in place before you take your Adwords campaign live. Ensure you have selected the right campaign type based on your objective. Search Network only – When you want your ads to be displayed on Google search results. Display Network only – When you want your ads to be shown on websites which your targeted audiences visit. These sites are called “Placements”. Search Network with Display Select - When you want to ads both on Google search results and other websites. Ensure that the “All features” sub-type is set, so that you get all the advanced options & features like ad scheduling, ad delivery and advanced location settings. Check that you have selected the right location (country, city, district etc.) where you want your ads to be shown. You need to set the Targeted location if you want your ads to be shown only in certain locations.This ensures you do not receive unnecessary clicks from the locations not relevant to your business. Ensure that you include and exclude locations through Advanced location targeting options, to make your targeting more effective. People in my targeted location - If you are focusing the audiences who are living in the targeted location. People searching for or show interest in my targeted location - if you want to show your ads to people who might not be living in your targeted but are searching for , or showing interest in the targeted location. People in, searching for or show interest in my targeted location - if you want to target both the audience types listed above. You also have the options to include or exclude places in the above criteria. Make sure that you copy the conversion code available in the “Tools - conversions” section and paste it in your Thank You or success page. This helps in tracking how productively the ad is being converted into leads. That can be a page sign up, purchase, phone call or app download. If you are not familiar with how the conversion process works, here's a detailed guide you can refer to. Ensure that you have created a Remarketing list for your campaign to track visitors to your website who you can target ads to later. This can be found in the audiences section under the Shared Library, in the left menu bar, as shown below. You can generate the remarketing code and paste it in all relevant pages of your site. To begin with, it is recommended to choose “Automated bidding”, where Adwords sets your bids to help get as many clicks as possible within your budget. After the campaign has run for a few weeks, you can switch bidding to “Manual” and set the Maximum you would be willing to pay per click. Verify that your billing information - country, billing address, and payment method have been added correctly. If you have chosen the “All features” campaign sub-type, you will have two options to deliver your ad. Standard – if your budget is limited and you want the ad to be evenly shown throughout the day. Accelerated – if you want the ad to be shown as quickly as possible. Optimize for clicks – Ads receiving more clicks are shown often. Optimize for conversions – Ads receiving more conversions are shown more often. Rotate evenly – All ads in the ad group are equally shown. Rotate indefinitely – All ads are shown for an indefinite amount of time. Check if you have set “Rotate evenly” in the Ad rotation settings, so that you give preference to all ads initially and then change the settings later to either “Optimize for Clicks” or “Optimize for Conversions”, according to the ad performance. Confirm that you have set the default bid and the amount you are willing to spend daily. Verify that the Auto-tagging is turned on, under the “Preferences” section in the Account settings. This helps in tracking which keywords have brought visitors to your website and to which ad group they belong. Google Analytics uses auto-tagging URL and determines the ad performance. Ensure that you have added all negative keywords, that apply to the account, to a shared list under the “Campaign keywords” section in the Shared Library as shown below. Confirm that you have applied the list to all the relevant campaigns in the account. While creating Ad groups, make sure you group together the keywords targeting a particular product or service ie. cluster the keywords in ad groups thematically. Make sure you follow the below mentioned best practices. Check that each ad group has a minimum of two ads, carrying different Ad titles and Descriptions , so that they run alternatively. After evaluating their performance over a period of time, the poorly performing ads can be be paused. At least one Mobile specific ad must be present in each ad group targeting mobile audience. You may notice certain truncated ads when you use mobile phones. It is because, those ads specifically created for the desktop users appear on mobiles. When you create ads, make sure you also create a copy of the ad and check the “Mobile” in the device preference option. Similar keywords should be grouped under each ad group. As a good practice, it is recommended that , each ad group contain no more than 10 to 15 keywords in it. Ensure that you use relevant keyword match types for optimal ad performance. Check if the first letter of each word in the ad description is capitalized. This is more for visual purposes. Capitalizing each word increases the visibility of your ad resulting in higher click-through rates and improved quality scores. As far as possible, make sure the First Description line ends with a period (full stop), so that, it moves up to the Headline. This is called an “Extended ad headline”. Most of the ads, with extended ad headlines stand out better on the search results pages resulting in better click-throughs on the ad. Confirm that the Ad title, Display URLs, & Description lines contain keywords in them. Check if the Destination URLs are directed to the relevant landing pages. Make sure you add all the relevant extensions to your ad. When the information in the ad text are not sufficient enough to showcase your product completely, Ad extensions help displaying additional information. Adding extensions also help the ad occupy a larger space in the SERP, which increases its prominence and visibility. There are seven different ad extensions which can be found in the “Ad extensions” tab under each campaign. Sitelinks extensions - Direct the users to the specific pages in the website and helps the users to find what they are looking for. Location extensions - Direct the users to the nearest product store. Call extensions - Call option making the mobile or tablet users to contact you directly. App extensions - Take the users to the app store in order to download the product app. Review extensions - Display positive reviews from various sources. Call out extensions - Again a descriptive text to the ad, helping the user to explore more about the product. Structured snippet extensions - Display additional landing page details. Also, verify that all the extensions are linked to the relevant pages. Make sure, no information already present in the Ad Description is repeated in the ad extensions. Remove or change it, if any. In order to prevent your ads showing up for irrelevant keywords, make sure you have added negative keywords both at an ad group level and at a campaign level under the “Keywords” section. Last, but not least, ensure that all ads have a Call to Action, which is the ultimate goal of any Ad campaign. Whenever you create your next adwords campaign, keep this checklist handy to ensure that you don’t miss out on anything important. Is there any check you carry out that we missed including? Do let us know in the comments below and we will have it included. Outbound and Interruption Marketing is losing its sheen in favor of Content Marketing and Native Advertising. Though they seem similar but there is quite a difference between the two forms of marketing. This article will help you understand the difference between Content Marketing and Native Advertising. Content Marketing is a marketing approach that involves creating valuable and useful non-promotional content by brands. The important part in the first sentence is “valuable and “useful”. Self-serving and promotional content cannot be placed in the content marketing bucket: Value-add is the only secret. Content Marketing can be done in varied formats but some of the key ones are discussed here. Videos are one of the most engaging form of content on the web. The consumer web video traffic is expected to reach ~80% by 2019-2020. For a long time, video marketing was considered a game for the big brands. But off late, this trend has been broken with small businesses and startups leveraging the medium to showcase excellent meaningful content. OYO Rooms launched a video on the occasion of Independence Day that garnered more than 3 lakh views in a couple of days. The Madras Song by Murugappa Group was launched as a tribute to the city of Madras on the occasion of Madras Week. The video stole the limelight during the 375th year celebrations of Madras. Blogs are an excellent way to build an engaged audience, showcase your company as an industry thought-leader and the same time boost search engine rankings. According to a recent Hubspot Survey, regularly blogging boosts lead generation by ~126%. It also provides fresh, unique content to your website that is an important factor considered in Google search rankings. Infographics are graphics that showcase long content in a visual and interesting manner. Our brain absorbs and process visuals faster than any other form of content. Hence, infographics as a form of content can be a great way to showcase information and make your blog more engaging. Slideshares and Case Studies are another fascinating form of content marketing. These are more suggested for B2B businesses. Companies are looking out for specific information and if your case study or a Slide Share can help fit into the gap, you will gain a relevant mindspace among your potential customers. Relevant and Informative Social Media Content can go a long way to help create an engaged community of potential customers. Innovative and clutter-breaking content can help your brand quickly carve out a niche on social media. Petwish – a startup in the pet food space, did an interesting content series around different dog breeds in India. The content quickly became viral among the pet lovers across India, which was an excellent audience for the brand. Podcasts or audio telecasts are possibly one of the most underrated content marketing tactics. It gives you access and visibility to a different set of audience – who are tuned to short content in a format where they can multitask “on the go”. For example, a motivational podcast while on the way to office in the morning or solid investment advice from an avid investor that will help you plan your investment strategy for the coming week. Native Advertising is a form of paid advertising where the content put out seems similar to the native content of the platform. You would have come across one or the other form of native advertising daily – while reading an e-newspaper, browsing through an ecommerce portal or on your favorite Google Search Engine. According to Business Insider, The global native advertising spend is estimated to cross $21 billion by the year 2018. Content Recommendations are one of the most prominent form of native advertising. You would have seen sections at the end of news articles under the title “Recommended Articles” powered by recommendation engines. These native ads are done via platforms like Outbrain, Taboola and Content.Ad. Influencer Marketing is a rapidly growing form of native advertising. Under this, the influencers and bloggers talk about your brand or product on their blogs or social media channels with a backlink to your online property. The articles are seeded along with the other articles on the blog. Search Engine Ads are those that surface on top of your search results. This form turns out cheaper than the other forms of native advertising, based on the cost per lead or sale. In-Feed Ads are presented within the list of natural articles from the publication. Though these ads are well-blended within the native experience of the reader on the platform but they are marked as sponsored ads for the benefit of the customer. Promoted Listings are the product listings that show up on top of the category page on ecommerce websites. Create separate landing pages for different native ad ideas. The hook to get people on your landing page and the content on the page need to speak the same story. Make it interesting. Only bragging about the brand doesn’t work anymore. Show the content and convince the reader that you are the one who can deliver the experience or service to the user. Do not shy away from allocating a good budget for this to show results. The cost per lead or sale from native advertising is traditionally higher from content marketing. If SEO is a prime goal for your experimentation with Native Advertising, then you should pause it immediately. There is no SEO takeaway from this exercise. Every marketing expert knows the importance of content marketing. It is a great way to engage with customers and to provide them with knowledge. Creating content that is both relevant and valuable to its target audience is at the very heart of effective content marketing. With the growth of mobile and internet in India, every town and village in India has access to Internet. Thanks to this internet revolution, most of the target audience can be found speaking another language apart from English. So how are you going to address this problem? Our solution is a multi-lingual content strategy. English is, of course, most commonly used language online not just in the world but also in India. However, Google data shows 94% growth rate for Hindi content consumption. Keeping this in mind global brands has started focusing on regional language as art of their strategy. A year ago, Facebook users were flabbergasted to see the login page in Hindi script. This was followed by US based visual discovery tool Pinterest launching a Hindi version, allowing users in India to use the translated version.Today, Google supports languages such as Hindi, Gujarati, Marathi, Bengali, and Tamil among others.With 127 million Internet users in India consuming content in local language, all global social media sites have realized the fact that they if they don’t go local in India they might soon lose relevance. Catering to the internet users in tier II and III towns, Google is now focusing to expand usage of its products like Google maps in vernacular languages, especially Hindi. Of the literate 74%, only 10% read English while the rest consume content in the vernacular medium. Remaining 66% are literate in their local languages. According to a latest study conducted by Internet and Mobile Association of India and IMRB International, regional content availability can boost the growth of Internet in India by 24%. There are more than 70,000 newspapers printed in India and around 90% are either printed in Hindi or other vernacular languages. Realizing the importance of regional content, Indian app developers are also recognizing the need for local app distribution platforms. International app stores do not lend themselves to the easy discovery of highly India-specific regional content. Yourstory.com, one of India’s leading platform for entrepreneurs and promoting the entrepreneurial ecosystem, recently included separate sections for regional content. The website also offers content in 10 other languages including Marathi, Telugu and Bengali. Their regional content strategy has taken off well and has received positive response from the audience. As you can see, the Hindi article has 650 shares and the Tamil content has over 200 shares. The website is updating their regional language pages everyday with interesting articles. So if you are convinced that regional content marketing is important, here are a few things to consider. It’s easy to ignore other languages if one dominant language makes up the majority. While English does make for the majority, there is a section that only consumes content in a regional language and this section could be your most important target audience. An English creative gets 0.1% to 0.15% Click Through Ratio (CTR), while a language creative can get 0.4-0.5% CTR. So if a language content and creative has a change to drive more traffic to your product or website, why not concentrate more on it? When you market your brand in a regional language, it appeals to the emotional quotient of the audience. So localization of content should be an integral part of the creation process. For instance, McDonald’s involves its international teams at an early stage of product development, ensuring it can adapt their most effective marketing strategies to each individual culture where its campaigns are rolled out. Its in-country translation and localization teams ensure that the content strikes the right note in each country. Your ultimate goal of participating in social media is likely to drive traffic back to your website so you can convert those visitors into leads. Without pitching brands directly, content marketing looks at generating relevant content that educates and creates awareness among customers. It has become an important marketing avenue for the fund-crunched startups to compete with the bigger brands. But it is very important that your content is unique and engaging for your customers. Duplicate or low-quality content can prove to be counter-productive. Once your regional content is up and running, the next step is to ensure that it reaches your target audience. There are many content amplification techniques that can help you promote your content to a large audience. The content strategy needs to be integrated with your social media marketing. It can be key to engaging consumers and many brands are successfully adopting this for their overseas marketing efforts. This video tells you why adopting a multilingual strategy is the only way to connect with the next billion Internet users in India. Have a particular interest that you are extremely passionate about? Then blogging is the perfect way to start exploring your interest. Blogging is a hobby or a way to build your brand. It is a powerful tool, which can be a great PR for you and your brand. A blog is a simple, easy-to-use platform for connecting with and sharing timely and relevant information with customers. It’s your direct communication channel. From an online journal at 1,000 words per post to a simple 140-character Twitter feed, blogging has taken center stage largely because of how useful it has proven itself to be in almost all areas of business. If successful, blogging can be a good way to make money and a full time career path as well. However, before we start talking about making a career out of it, the first step is to determine a topic of interest and set up the blog. To set up your blog hardly takes 30 minutes. If you are planning to start the blog, then here the various top blogging platforms that you can use. WordPress is one of the most popular free blogging platforms that is excellent for the bloggers. It has numerous templates to choose from. Apart from this, have the option to go for the WordPress customization to personalize the blog with your own designs. Yet another free blogging website, Tumblr has gained a significant amount of reputation over the years simply because of its user-friendly interface and easy to understand features. There are plenty of stunning blogging themes and awesome features that help you to create a fine blog. The best feature though is the fact that you can synchronize Tumblr account with the various popular social networking websites such as Facebook and Twitter to update your feeds made in the social sites at a distinct location. Weebly comes with a drag and drop feature to create a website. It’s simple and easy to understand interface makes weeebly one of the best blogging platforms. A very unique thing about this particular website is that you can also use it as a content management system that provides you an opportunity to earn some money by designing the websites for the other clients. A service for journals and blogs, that also offers privacy controls, photo storage, publishing tools, style templates, and online communities for many interest. Once you have finalized on the topic and template, you need to concentrate on increasing traffic and your following. For a blog to be successful, you need more than great writing. You need to market your blog to the right audience and generate traffic to your blog. So how do you build that traffic? Here are a few tips you can follow. Commenting on other blogs and participating in social media networks and groups is vital to building traffic to your own blog. Even a great blog post in useless without a little bit of marketing and promotion. Promote your blog on social media like Facebook or twitter and post links more than once to get some attention. Whatever method you choose for your blog, take it seriously and don’t leave marketing your own blog up to chance. Get your blog SEO optimized by using common search queries throughout your writing. This will move your blog closer to the top of search engine result pages, and make people more likely to read your posts.You can also access the traffic by using website traffic statistics software Google Analytics or the simpler traffic statistics software that should come for free with your hosting account. Guest posts are the articles, which a blogger writes for some blog/websites other than his/her own blog. Such guest posts have a link-back to the author’s blog, this helps in getting recognition, reader’s attention and search engine’s attention as well. Writing on other’s blogs is a great way to tap into their audience and introduce yourself to new people. Find blogs you enjoy would be able to write great content for. Influencer marketing is a new concept that is picking up in India, where brands connect with popular bloggers and influencers who promote products by creating original articles, reviews, videos & social posts to over their followers. With increasing internet penetration and digital spending, influencer marketing is all set to grow in the near future. According to a McKinsey study, marketing-inspired word-of-mouth generates more than twice the sales of paid advertising, and these customers have a 37% higher retention rate. Bloggers have become important influencers because they are seen as authentic and have loyal followings. When a blogger recommends a product it seems more trustworthy than traditional advertising. Websites like influencer.in lets you register as an influencer and be part of their campaigns. So keeping this in mind, brands are willing to pay influencers to promote their product. There are bloggers who work for free as they are passionate about writing, but there are bloggers charge a huge fee and we most brands are willing to pay for them. If you have a popular blog running for a while now on a particular subject, then a lot of websites, paper or magazines will be willing to let you write for them and pay you for it. Freelancing is a way of earning money through your skills and expertise. For example, if you have a fashion blog that is doing well, you can write for fashion lifestyle websites. You will be amazed at the number of people willing to pay you money for your advice, which you were probably giving out for free until now! To implement this, you can have a landing page on your blog and have a catchy title like “Hire me” for potential recruiters to find you. This is a great way to make money out of your blog. How it works is that you get to choose which ad will be displayed on your blog and you also set the price for the ads. In this method advertisers get in touch with you directly to place ads on your blog, thus eliminating the middleman. When a reader click on the ad, you get paid a commission or you can choose to charge a flat fee to the advertisers on a monthly or weekly basis. Advertising networks such as Google AdSense, BuySellAds, TribalFusion, and BlogAds have made it relatively easy for bloggers to monetize their work. This is an interesting tool for page analysis of brands in social networks. The free version allows you to analyze the effectiveness of the content, subscriber’s activities, track pages of competitors and make monthly reports. In general, Fanpagekarma can help optimize your social media marketing strategy. Befunky is an easy and useful photo editor and collage maker. It has all functions you need for editing photos for your social media channels from the simple edits like crop, option of changing colors, beautify and more advanced edits like fill light, exposure, and straighten. Many interesting fonts are available that can be used to make posts with tips, quotes and facts. A Malaysian startup based in Penang, Piktochart is service for creating elementary infographics or graphic image using ready templates or creating something on your own. An important feature of Piktochart is its HTML publishing capability, which generates infographics that are readable by search engines, with multiple clickable elements for users. Photoshop online or Photoshop Express Editor makes your snapshots look great with easy options for quick fixes and creative enhancements. You can experiment with filters and fonts "liven up" your graphics with simple actions. Flickr lets you upload, access, organize, edit, and share your photos from any device, from anywhere in the world. Is Instagram a part of your social media marketing? Then Schedugram is an excellent tool for you. It lets you manage multiple Instagram accounts. Instagram was designed as a mobile tool, but Schedugram gives opportunity to post from your desktop or laptop. It allows you to schedule your posts and post photos as well as videos. It also has tools that allow you to do things like crop, add filters, light and saturation properties and other cool effects before posting. Gratisography is a fresh service with free high-resolution pictures you can use for your personal and commercial projects. All pictures were photographed by Ryan McGuire. The choice is large and if you are tired of Google images and want some variety, you are welcome to use Gratisography. It is weekly updated with new pictures. Google Alerts is a content change detection and notification service, offered by Google. With Google Alerts, you can monitor your topics and regularly receive mails of the most recent mention of it on the Internet. Secondly, it allows you to track mentions of your company or even a person. The most important aspect is that you to track, in real-time, the clicks and referrers on any shortened URL - a perfect tool to help you understand what appeals to your audience. Businesses across the globe leverage Twitter for marketing their business. And, India has not been a mute spectator to the rapid rise of Twitter as a micro-blogging tool. This presentation can help you learn about important aspects to be considered for marketing your brand on Twitter. Brands have achieved a considerable amount of success on Twitter, marketing their products and services to people. But, it has also created uneasy spots for brands which have been at the receiving end of consumer's ire. On one hand, you have businesses who taken to Twitter to connect and engage with the fast-growing audience and on the other hand, you have the Influencers right from Bollywood stars and sportstars to leading bloggers. Building a brand on Twitter requires commitment and you cannot expect a big return on investment overnight. Of late, it has also emerged as a customer service & a market research tool. It is helping brands to understand what their consumers say about their products and at the same time service any concern raised by them. Often when we track results via digital marketing, we tend to track website traffic along with goals (transactions or leads generated). One element we have seen many bushinesses miss out on is tracking how many phone calls were generated via the online medium. If you do not track and calculate the calls generated, it is a significant number of leads that are missed out or rather not counted into the digital metrics. The power of pushing a phone number on your landing page, social page, or website is dynamic. Depending on the nature of the business and the product/service type, placing a phone number makes it easier for a customer to engage with your business. Call tracking via Google Analytics, Google AdWords & Google Plus allows you to monitor which visitors from your website, social ads, and other digital promotions who have conversed with you via phone. While the three methods do not encompass or track all calls but its a huge step from not tracking the calls. So lets look at each of these tracking methods in a bit more detail. Once you have implemented all these three methods, you can add these numbers to your existing results metrics to understand the true impact of your digital marketing efforts. When users click your phone number (on a mobile device) to call your business, Google Analytics is able to track these via what they call "Event Tracking". Events in this scenario could mean phone calls or even downloads, video plays etc. Configuring the Google Analytics event tracking code while easy, requires some technical know how. So do involve your technology or web team to help you get this done. This google analytics event tracking code is used to record a user’s interaction with the website elements and in this use case we tracking the number of people who clicked on the phone number to call the business. category (mandatory field) - The common name given for the phone numbers you want to track. action (mandatory field) - A string that is uniquely paired with each category, to define the type of user interaction for the web object. label (optional field) - An optional string to provide additional dimensions to the event data. value (optional field) - An integer that you can use to provide numerical data about the user event. non-interaction (optional field) - A boolean that when set to true, indicates that the event hit will not be used in bounce-rate calculation. Customers can call your business after clicking on a Google ad and learning about the products and services that you offer on your website. The AdWords click-to-call ads help you connect with these customers. These ads encourage calls to your business by showing the phone number on the ad. On smartphones and other high-end mobile devices, these phone numbers are often clickable and cost the same as a standard CPC would demand. Click-to-call ads also help you to gain insights about the calls. These stats help you understand which keywords and ads are driving the most phone calls, which results in the optimization of these ads to make the graphs better. To activate these you will need to go to the Ad Extensions Tab. Google+ provides the easiest steps towards gauging the call metrics. One has to simply make sure that his/her business page furnishes all contact coordinates clearly. Furnishing all information makes your contacts visible in the search engine, where customers are given the power to call your business by a single touch of the button. The metrics towards these calls can be viewed in the 'Insight' tab of you the business's Google+ page. Learn more about Event Tracking – Web tracking & click-to-call ads to unlock the potential of your landing page or website, to monitor the amount of audience who convert through calls.